I am in love with no-boil pasta recipes. Boiling pasta isn't a big deal, but it takes time for the water to boil and then cook the pasta. Not to mention the extra dirty dish. This pasta dish is literally a one-pot dish. This was so creamy and delicious. I cheated and used the new Oscar Meyer Turkey Bacon Bits in this dish. I saw them when I was grocery shopping and decided to give them a try. They tasted great in the pasta and cut down on the cooking time. This took less than 30 minutes from start to finish and had very little hands-on cooking time. Sounds like the perfect weeknight meal to me! 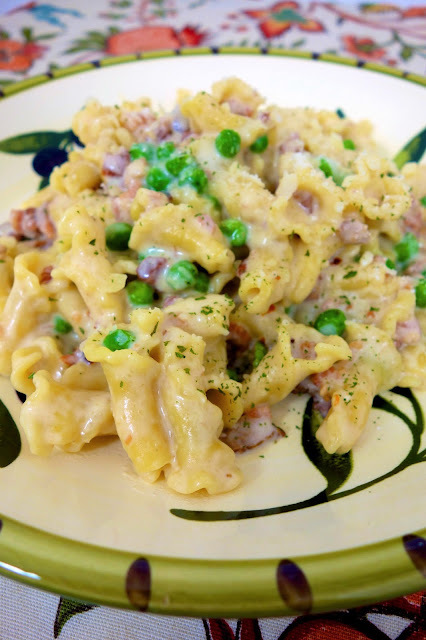 In large skillet, combine pasta, evaporated milk, chicken stock, onion powder, garlic powder and red pepper flakes. Cover and simmer for 15-18 minutes, until pasta is done and liquid has reduced. 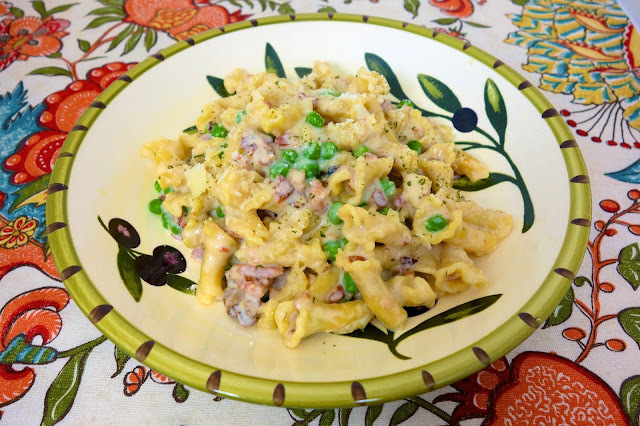 Stir in parmesan, cream cheese, frozen peas and bacon. Simmer for 5 minutes. Remove from heat and let stand, covered, for 5 minutes for the sauce to thicken. It looks good...but I just can't bring myself to use frozen peas. I'm sure I could figure out something else or even just leave them out altogether. But...let me just say.....BACON!!!!! No boil seems like a great way to get a delicious meal to the table in a hurry. Um, YUM!!! I can't wait to try this one! This looks yummy and perfect for no extra dishes. I'm always a fan of that! Thank you for yet ANOTHER awesome recipe! I made this last night and everyone LOVED it a lot. I also made your Garlic Bites along with it and those were a HUGE hit also. I did reduce the Italian Seasoning to half however because while I love Italian Foods, I have to be careful because one of the common spices used in those I just cannot handle myself taste wise. I was very happy with the reduction of that seasoning and truly, I think leaving it out altogether would be just as awesome. I doubled the recipe and probably could have doubled that yet again. VickiT - YAY! Glad to hear it was a hit! If you don't like peas, use whatever veggie you do like, broccoli, carrots, artichoke, mushrooms....we made it from the original, added more bacon and peas. Loved it all the way. We did a bit of water at the end, about 2 tablespoons. Will have this often. We used bow tie pasta.